At Diesel Services of America we can help you with a large selection of Volvo Penta Marine Parts. Let us help you locate everything you will need to keep your vessel running in day one factory-like conditions. We only use genuine Volvo Penta Marine parts and will get them in a timely manner at great prices. Diesel Services of America is known for their knowledge in the marine diesel industry and delivering a quality service in a hassle-free environment. Volvo Penta services many different marine industries from recreational to commercial with different varieties of marine engines (Volvo Penta Forward Drive, Gasoline Sterndrive, Volvo Penta IPS Diesel Sterndrive, Diesel Inboard, Marine Commercial High Performance, Marine Commercial Heavy Duty, Marine Gensets & Auxiliary, Industrial Off-Road Applications, Industrial Power Generation). Volvo Penta IPS the revolutionary twin counter rotating props are forward facing operating in virgin water. Prop wash and other issues related to caveating are completely eliminated. All prop thrusting has been designed to be in parallel with the hull. Zero energy loss as all power and thrust pushes the boat forward. EVC (Electronic Vessel Control) with the joystick helm was created by Volvo and is the most efficient way to operate a vessel. Diesel Services of America will help you with your Volvo Penta Marine Parts related to your EVC. EVC was developed to be the safest way to navigate in addition to being downright fun to use. 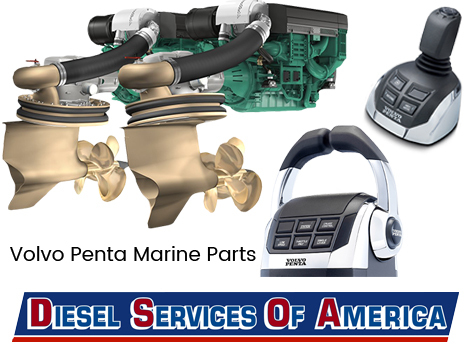 Call Diesel Services of America for any Volvo Penta Marine Parts or click here to find parts.